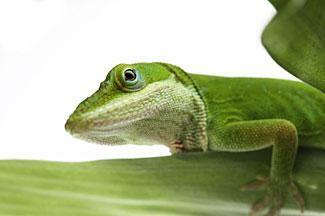 Green anoles are small, hardy lizards found through much of the southeastern United States. Some people keep green anoles as pets. Green anoles normally live in trees but can be found in a variety of areas. The small lizards are commonly found in suburban yards, perched on fences or even roofs. Although green anoles are usually bright green, they can also be brown or grayish. They are also referred to as American Chameleons because they can change color; however, they are not related to true chameleons. Their colors change due to factors such as health, temperature, and mood. Which Lizards Make Good Pets? Green anoles are the only anole native to the United States. Since they change colors in response to temperature changes, green anoles are normally green when they are warm and active. Their color changes to brown when they are cold or sleeping. If stressed or ill, the lizard often turns a dark brown. Males have a pinkish colored fan or dewflap, (a flap of skin) on their throats that easily identifies them from females. The small lizard grows to approximately 8 inches in length with females measuring slightly smaller. Green anoles have a typical lifespan of approximately four years, although they may live up to eight years. Green anoles are active during the day and like to bask in vegetation. During cool weather, they may be found hiding under tree bark or even roof shingles. Green anoles are quick and agile. They have pads on their feet that allow them to easily climb and cling to a variety of surfaces. Male anoles are territorial, and display behavior such as head bobbing to express dominance. A male anole will extend its throat and flare its dewflap to make its body appear larger. It will also turn its body sideways toward an opponent as a form of intimidation. Male anoles will open and close their dewflaps as an aggressive act to defend territory, or to entice females. They can only detect prey that is moving. 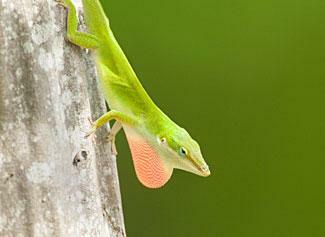 Green anoles prefer insects that move fast since they enjoy the chase. They drink water from the dew on plant and tree leaves. Green anoles are not harmful to children or pets. They are actually beneficial since they consume a variety of insects that can infest homes or harm garden plants. If you have a green anole pet, pay careful attention to how you house it. Use a 24 hour under-the-tank heater to provide a temperature range. A 50-watt aquarium heater is a good choice to provide your anoles with humid heat. Use two thermometers on each side of the aquarium to keep track of the cooler and warmer areas of the temperature range. During the summer months, pet anoles can fare well in room temperature, but winter months can be particularly difficult and they need 80 degrees Fahrenheit or higher temperatures in order to digest their food properly and remain healthy. Full-spectrum UVA and UVB lighting is used to create the artificial sunlight necessary for anoles to synthesize vitamin D3. Position full spectrum and basking lights outside the cage so the anole does not burn itself. Feed adult anoles approximately five crickets per day. Dust the insects with a vitamin powder before feeding. You can also feed your pet lizard houseflies, mealworms, silkworms, and fruit flies. It is best to feed anoles the same time each day and in the same area of the enclosure. Anoles typically drink moisture from leaves. Use a drip dispenser for water so that drops may be placed on plant leaves and mist the the inside of the aquarium two to three times daily. You can also put a small water dish in your pet's habitat, however, don't be surprised if your anole doesn't drink from it. Green anoles are relatively low-maintenance pets. When you are purchasing your anole, look for an animal that is active and alert. Don't be alarmed at the sight of lost toes or missing tails since anoles regenerate them. Regardless of the type of pet you own, you need to find a reptile veterinarian, and schedule an initial exam for your pet to assess its health. Call prospective veterinarians and inquire about prices and practices before choosing one. At the initial examination, you will find out how healthy your anole is, and how you can maintain its health. If you have any questions, be sure to ask the veterinarian. Once you take your pet home, observe it closely to learn about your pet. It is easier to care for your anole, and treat it properly, if you are familiar with your pet's normal appearance and behavior. Mouth Rot is a secondary infection that occurs with cuts around the snout or mouth. Symptoms include a puffy, discoloration around the mouth and a cheesy build-up between the teeth. Left untreated, the condition can result in tooth loss, deterioration of the jawbone and possible death. Consult a veterinarian for treatment. Respiratory ailments are rare in green anoles but may result from cold, damp environmental conditions such as excessive dampness in the enclosure. Symptoms include labored breathing through a partially opened mouth. Consult a veterinarian for treatment. Keep the enclosure clean and dry. Use the proper substrate. Metabolic Bone Disease results from improper nutrition or lack of UV - B rays. Symptoms include thin body, weakened legs and puffy jawline. Treatment consists of high quality nutrition and proper full spectrum lighting. 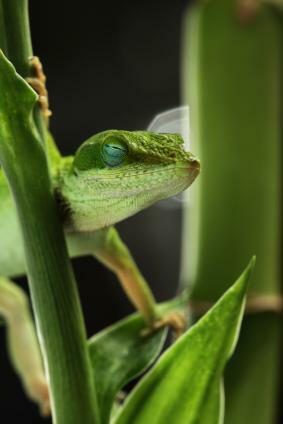 Green anoles are relatively easy to keep happy and healthy. If properly fed and cared for they can live a long, healthy life and keep you entertained with their clever behavior and playful antics.